Stout, a graduate of Franklin College, has worked in the Green Industry since the age of 17. 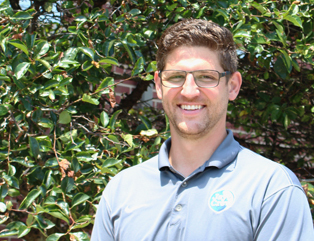 He has worked for several landscape companies, small and large, networking and gaining knowledge in hardscapes, plant material, and all aspects of landscaping. He knows the importance of nurturing and maintaining the health of plants, flowers, and other vegetation. He has a Commercial Pesticide Applicator License and is also a member of Indiana Nursery and Landscape Association. Andrew lives in Indianapolis with his wife and daughter. When he isn’t working, he loves taking summer trips to Tennessee to be on the lakes. He enjoys spending time in the sun and being on the water – boating, skiing, cliff-diving, or simply floating down the river.